A lumbar puncture, or spinal tap, is a procedure to collect cerebrospinal fluid to check for the presence of disease or injury. 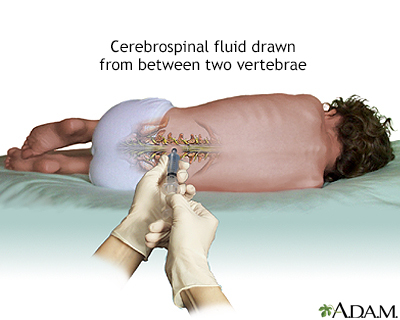 A spinal needle is inserted, usually between the 3rd and 4th lumbar vertebrae in the lower spine. Once the needle is properly positioned in the subarachnoid space (the space between the spinal cord and its covering, the meninges), pressures can be measured and fluid can be collected for testing.